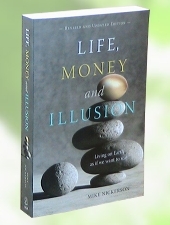 Adapted from Life, Money and Illusion; "Living on Earth as if we want to stay. Money is an extraordinary invention. It enables exchange and cooperation between people on a vast scale, as long as trust can be maintained. Because our planet is now practically full with the impacts of human activity, debt based money, with its compulsion for growth, is now a problem. Other forms of currency that don't have this problem are described here. Trust and cooperation get another boost when people use a monetary system with a demurrage charge. Demurrage is a small fee regularly subtracted from the value of money. The rationale behind a demurrage charge is that money is a public service, like a postal system or public transportation, and that a small user fee should be levied on its use. The difference between a demurrage charge and an interest charge is that interest is a demand for money in addition to the principal, while demurrage is a charge subtracted from the currency itself. While both are fees for having money, the difference in the impact the fees cause is immense. Demurrage can be applied in a number of ways, but in essence, it means that if you are paid $100 today and use it right away, you have $100 of purchasing power. If you hold on to it for a month, you would have to pay a “parking fee” of $1, and if you hold on to it for another month, the fee would rise to $2 and so on. Obviously, this is an incentive for you to spend your money sooner rather than later. Demurrage changes the nature of the monetary system in a number of significant and beneficial ways. Primarily, that currency would no longer be suitable for storing value. In long-term storage, the “parking fee” would reduce your holding to nothing. To receive the full value from one’s income, it would have to be spent within a short while. When it is spent, the people receiving it would also want to spend or invest it as soon as they could. Over and over, the currency would be spent at the first practical opportunity, employing people at each step along the way. circulation rather than for collecting in piles. The tendency for such a monetary system to stimulate employment is, in itself, a good reason to consider adopting it. The point is not to discourage saving. Once we have taken care of our immediate needs, it is natural to save for retirement, education, a new business or other interests. Demurrage currency would assure that an inclination to save doesn’t have the side effect of taking money out of circulation. Instead, for our future needs, we would look for tangible things to invest in that would maintain value or even grow in value over time. Insulating the house and other energy-efficiency measures would reduce future costs; maintaining buildings and equipment would preserve and enhance their value; buying tools can reduce our expenses by enabling us to do things for ourselves or to increase our income by doing things for others; investing in local energy production and local food production creates additional value with time. When long-term well-being is thoroughly integrated into economic policy, investment institutions would be focused exclusively on maintaining the world within sustainable bounds. If one wanted to save for the grandchildren’s education, for example, one could invest in such institutions, and they would organize truly beneficial productive work. There are countless things we can do to improve the world around us so that, over time, our security and the opportunities available will be as good or better than at present. Even small amounts of savings could preserve their value through such arrangements. With the present system of interest-bearing money, the value of anything in the future is discounted. The return expected from planting a forest or insulating a home would be weighed, unfavorably, against the potential earnings of that money if invested in an exponential growth scheme. The further into the future one looks, the less “rational” it seems to use money for anything besides financial investment. Planning for the seventh generation becomes a joke. With demurrage currency, such discounting no longer applies. Faced with the choice of purchasing something that will last or a cheaper item that will leave us with some of the depreciating money left over, the inclination will be to buy more durable items. By storing value in the maintenance of buildings and equipment, the creation of things and nurturing things that grow, our world would be actively upgraded. The currency spent on this upgrading would go back into circulation, maintaining employment and, in turn, giving more people opportunities to decide how they think their savings can make the world more valuable in the future. Over time, we could expect a great deal of improvement in the human condition and our consequent security. It is notable that with a demurrage currency system, decisions about what to invest in to improve the future would be made by every person earning money. It is much more likely that as individuals we would invest in food, shelter, durable goods, healthy forests and fields, education and art to upgrade our world directly, rather than war planes and bombs to force economic advantages from others. Demurrage would reprogram the invisible hand by shifting the medium for storing value away from money and into the restoration, maintenance and upgrading of the world around us. There would be no need for moral persuasion; the basic economic structure would divert people’s self-interest toward more sustainable practices. Multiplied by the economically active population, the changes in outcomes would be massive. Monetary systems based on demurrage have existed for a long time. Economic historian, Bernard Lietaer, uncovered several examples. The earliest of these was in Egypt. The biblical stor y of Joseph’s interpretation of the Pharaoh’s dream about seven years of abundance followed by seven lean years is well-known. Much grain was stored during the time of plenty, and consequently, starvation was avoided during the lean years. Our world might be very different today had that story included an explanation of the grain storage system — the basis of Egypt’s economy for over a thousand years. the cost of storage and loss to rodents. The ostraca, which have been uncovered in Egypt by the thousands, were, in effect, a commodity based currency that was traded throughout the population. The grain storage fee was a demurrage charge. Because the storage fee increased with time, those who received ostraca were inclined to invest, rather than hold on to it. Monuments that last forever were one expression, and for the common folk, irrigation systems and other land improvements were others. The productivity so inspired gained Egypt a reputation as the “breadbasket” of the ancient world, a status it enjoyed until the Romans forced it to adopt their monetary system, complete with interest charges. Since then, Egypt has been a “third world” country. among these were the grand cathedrals, almost all of which were constructed during that time. In addition to being places for worship, community gathering and festivities, these cathedrals were destinations for pilgrims. A city or town with a grand cathedral attracted pilgrims, and like tourists today, pilgrims would stay in local accommodations and buy local produce. In France, the city of Chartres still earns substantial revenues from people coming to see its cathedral, 800 years after it was completed. Lietaer points out that not only were most of the great cathedrals built during this time, but records show that mills and other assets were maintained at high levels of upkeep, and the quality of life of common laborers was also very good. Perhaps, relative to their times, better than today. Not all examples of demurrage currencies are from pre-capitalist times. In 1930 the owner of a bankrupt coal mine in Germany maintained opera tions by paying miners with “wara,” a local “stamp scrip” backed by coal. The scrip, as monetary notes are sometimes called, had squares on the back where the current month was stamped to keep the money valid. A small fee was charged with each stamp to cover the associated storage costs of the stored commodity. Miners were able to buy their food and other necessities with wara, and the idea spread rapidly throughout the depressed country. By the latter part of 1931, wara were in use throughout Germany. Over 2,000 corporations were cooperating by accepting and paying out wara, and a variety of additional commodities were added to coal to back up the currency. Unfortunately, the German Central Bank asserted its monopoly on money creation and had the experiment prohibited. The word was out, however. Bernard Lietaer describes the following experiment (reprinted here with permission) that took place soon after, just to the southwest of Germany. In 1932 Herr Unterguggenberger, mayor of the Austrian town of Worgl, decided to do something about the 35 percent unemployment of his constituency (typical for most of Europe at the time). He convinced the town hall to issue 14,000 Austrian shillings’ worth of “stamp scrip,” which were covered by exactly the same amount of ordinary shillings deposited in a local bank. After two years, Worgl became the first Austrian city to achieve full employment. Water distribution was generalized throughout, all of the town was repaved, most houses were repaired and repainted, taxes were being paid early and forests around the city were replanted. It is important to recognize that the major impact of this approach did not derive from the initial project launched by the city, but instead had its origin in the numerous individual initiatives taken in the process of recirculating the local currency instead of hoarding it. On the average, the velocity of circulation of the Worgl money was about 14 times higher than the normal Austrian shillings. In other words, on the average, the same amount of money created 14 times more jobs. More than 200 other Austrian communities decided to copy this example, but here again the Central Bank blocked the process. A legal appeal was made all the way to the Supreme Court, where it was lost. Lietaer and co-author Stephen Belgin reveal much more about the institution of money in their book Of Human Wealth: New Currencies for a New World. For more information see ofhumanwealth.com and complementarycurrency.net. projects as a means of getting federal currency back into circulation. that we choose to develop money systems that will enable us to attain sustainability and community healing on a local and global scale. These objectives are in our grasp within less than one generation’s time. Whether we materialize them or not will depend on our capacity to cooperate with each other to consciously reinvent our money. With all the options available for the creation of money, one can imagine an order whereby the fundamentals of civilization — sewer, water, education, health care and environmental protection — could be secured with interest-free money, where mushrooming fortunes could be kept in check with demurrage currency and where individuals could provide capital to someone else’s enterprise and draw a reasonable interest from the success of that enterprise. enough extra to maintain the municipality’s interest in repaying the loan. If all payments are made in an orderly fashion, when the loan is finally retired, the interest payments, minus inflation and management costs, could be returned to the municipality for the continued maintenance of the city’s infrastructure. money to Canada at nominal interest rates. Since the interest was paid back into the general revenue of the Canadian government, the portion of the nation’s spending that was financed by the Bank of Canada (around a quarter of the budget) was interest free. This arrangement financed much of Canada’s participation in World War II, and afterwards, built houses, roads, schools, universities and hospitals, started Medicare and initiated the Canada Pension Plan. These things were the products of Canadian ingenuity and labor. The interest-free money simply enabled Canadians to participate in creating the quality of life of which they were capable. They were good times: unemployment was low, inflation was low, interest rates were low, and public debt was low. nurture well-being in a country or through local communities creating currencies to accommodate trade among the residents, when money is put into circulation without an onerous interest fee, there is a far greater potential for creativity, trust and cooperation.